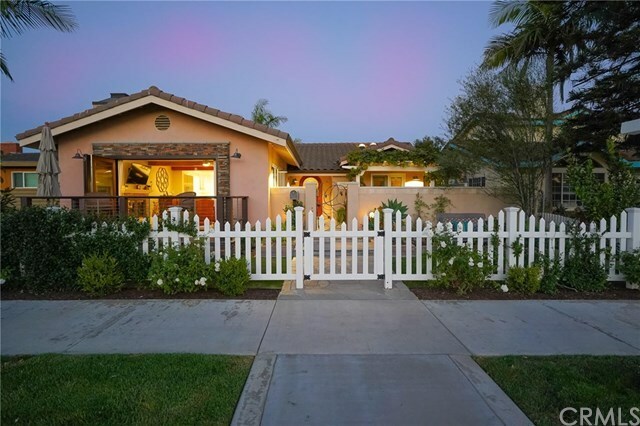 This stunning, recently remodeled single-level home located in the heart of Huntington Beach is truly a one-of-a-kind property. Adorned w/ tasteful upgrades throughout, & a wonderfully landscaped mature garden in the backyard, this home has everything you could want. Impress family & friends in your open-concept gourmet chef's kitchen or enjoy a glass of wine on your front deck overlooking historic Main Street. Celebrate the 4th of July w/ one of the best spots in the city as the renowned parade passes by right in front of your home! The ocean breeze pours through the accordion doors into your living room, but you can relax w/ central cooling for those extra warm summer days. The living room features stunning beamed ceilings and opens into the breathtaking kitchen offering quartz counters, an oversized quartz island, wine refrigerator, & top-of-the-line stainless steel Thermador appliances! Two roomy guest bedrooms off the hall share a full bathroom, upgraded nicely w/ quartz counters & a heated towel warmer. The backyard is your own private, tranquil oasis, featuring flagstone tiles, impeccable landscaping & plenty of space to relax w/ family & friends. A separate unit attached to the 3-car garage is fully equipped w/ a closet & kitchen, making it the perfect space to rent out or host extended family. Located just a short bike ride to the ocean and close to award-winning schools, this home is coastal living at its finest.